How do I deactivate my machine? Since your software license is personal and only allows to use two computers at the same time, you should always keep strict control of your activations. To do so, there are some cases where you might want to deactivate GrandVJ on a computer. For example, if you want to move GrandVJ to a new computer, if you want to use GrandVJ temporarily on a rented machine or on a computer pre-installed in a venue, if you intend to sell your computer etc..
You cannot deactivate a computer by deleting a Serial Key in your customer account on the ArKaos web site. 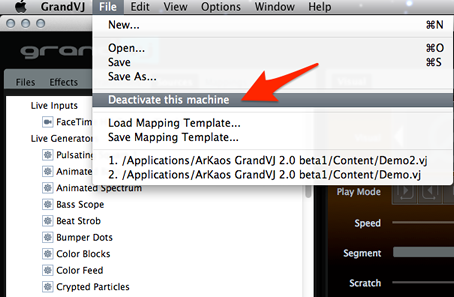 The only way to deactivate GrandVJ on a computer is from the “Activation” tab in the “Preferences” window, or from the “File..” menu in GrandVJ, on the computer you want to deactivate. The computer must be connected to the Internet. 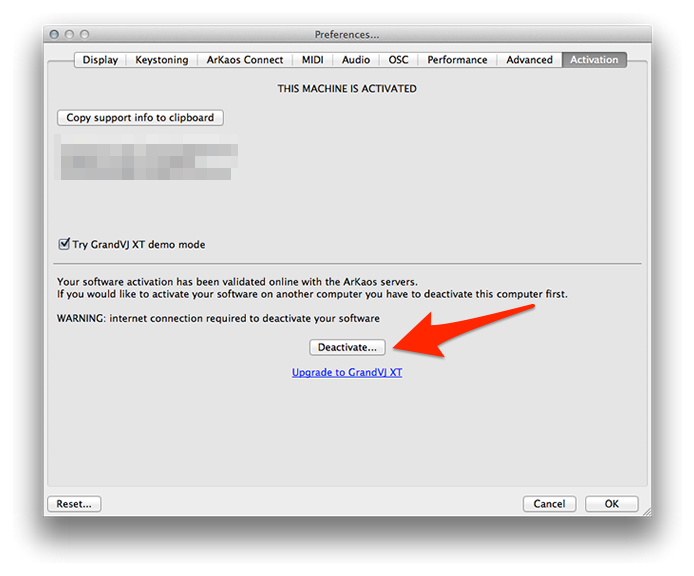 Once you press the “Deactivate..” button, GrandVJ will connect to our servers remove its Serial Key in your customer account. The software will then confirm successful deactivation and quit. If you restart GrandVJ on that computer you will get the software registration dialog box and the option to use GrandVJ in Demo mode.